23rd June 2013 – G DRAGON 2013 WORLD TOUR: ONE OF A KIND IN MALAYSIA has invaded Stadium Bukit Jalil yesterday night with tons of excitement and hype! It was definitely a one of a kind international kpop act! A few hours before the concert has even started, the VIPs and G.D diehard fans have already gathered at the venue to take part in some of those on-site activities. Some of them with free-standing tickets went there earlier in order to secure a better place for best view of G Dragon performance. Besides, some lucky fans were actually able to watch G Dragon’s rehearsal. Besides being flooded by fans, the stadium was also surrounded by people selling food and some G Dragon or Bigbang related items. Of course, there was also an official booth from organizer selling genuine G Dragon One Of A Kind World Tour imported merchandise. After the gate has opened, the big screens in the stadium were showing G Dragon Music Videos to keep the audience entertained before the concert started. At around 8.20pm, there was an introductory video projected onto the big white curtain in the centre of the stage. The video was showing G Dragon driving a fast car and all of the sudden the curtain was removed. Then, GD appeared onto the stage with a crystal-like stylish car. Then, he began singing his opening song, “MichiGo”! The fans were screaming in joy as they saw their idol appeared right on stage! After the first song, GD has greeted the fans and continue singing a few more songs such as “One of A Kind”, “The Leaders” and etc. Some of these songs feature other singers. Since these singers were not able to attend the concert as guests, GD and the crew have creatively invented a way to make them come on stage singing too! These singers such as Tablo and CL have been projected onto a movable screen and the screen was moved from side to side as though they were really there on stage performing alongside with GD! G Dragon One of A Kind Concert has been a really unique concert. It was filled with many props which have made it even more interesting! For example, during certain songs, GD was riding onto a scooter which allowed him to move easily to each corner of the stage. This has allowed the fans to get a closer glimpse of their favorite idol! Well-adjusted lighting and massive amount of fireworks have also made the atmosphere more explosive and exciting! Another main attraction during the show was when the DJ Instrument Set appeared on stage. G Dragon has shown the fans his skills in mixing the beats and singing with that instrument set! It was truly amazing and GD is undeniably talented! This show has been a real treat for the VIPs because other than being able to witness GD’s performance, they were also able to enjoy the performance by GD’s fellow Bigbang member, Taeyang! Taeyang has come on stage to perform a few songs while GD was changing his costumes at the backstage. And yeah, GD has changed a lot of costumes throughout the whole show! GD’s last song was Crayon remixed with Fantastic Baby! It was the peak of the show when he performed this song because everyone in the stadium were jumping, screaming and singing along! Taeyang has also reappeared on stage too to perform the song “Bad Boy” alongside with G Dragon! After that, G Dragon has introduced his band members and dancers to the audience. Well, the band members and dancers have received quite a lot of shouts and applause too! Apart from introducing the crews, he has also informed the fans that his solo album would be released on August 2013! So, fans, do look forward to his new album! And, he also stated that, he would bring Bigbang to Malaysia again in the future! Last but not least, he finished the show with his very last song which was also his opening song, MichiGo! The whole show lasted for around 2 hours and it was superb! Daebak! Million thanks to the organizers Running Into The Sun and WooHoo! 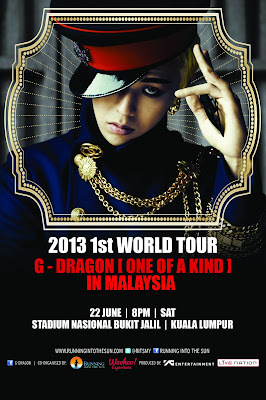 Experience for bringing such a world-class Kpop concert to Malaysia!